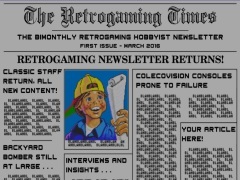 The Retrogaming Times ist ein Retro-Computermagazin (Englischer Sprache) für alle Retro-Computer-Fans. In dieser Ausgabe: Prepare to Qualify, Upcoming Events, More C64! - Marvel Licenses, Apple II Incider - Buying Games, Playing Games and Other Miscellaneous Retro Themed Stuff, Intellivision Amico, Here We Go Again, A History of Pac-Games on Atari Lynx and Jaguar, The Retro Junkie - Pokémon and the Evolution of Memories, The Controller Chronicles - Atari 5200 SuperSystem, Weekly Retrogaming Trivia Recap und See You Next Game.